It's been a week since I started my Disneyland Half Marathon weekend adventure, and I've been blowing through blogs and recaps like a mad man trying to get everything on paper while it's still fresh. Now that I'm to the point of an actual race recap, I have no concern about being able to pen something that can show you what an awesome time I had in Anaheim. After a long Friday that started before 5am with the runDisney Disneyland Half Meetup, followed by a few hours in the race expo and some time in the park, it was time to head back to the hotel to prepare for the 10K on Saturday morning. Karen, being the convincing voice that she is, had persuaded me that a costume was in order for running the 10K. My friends will attest to the fact that I avoid costumes at all cost, even refusing at Halloween or Mardi Gras when it's socially acceptable. I finally gave in and told Karen that if she put it together, I'd wear it. I arrived in Disneyland following the instructions to have black shorts to wear, and she'd take care of the rest. During prep for the 10K, I was handed a Ziploc bag with a black and white striped shirt, red and white striped tube socks, and red suspenders. At first I thought we were going as Robin Thicke and Miley at the VMAs. 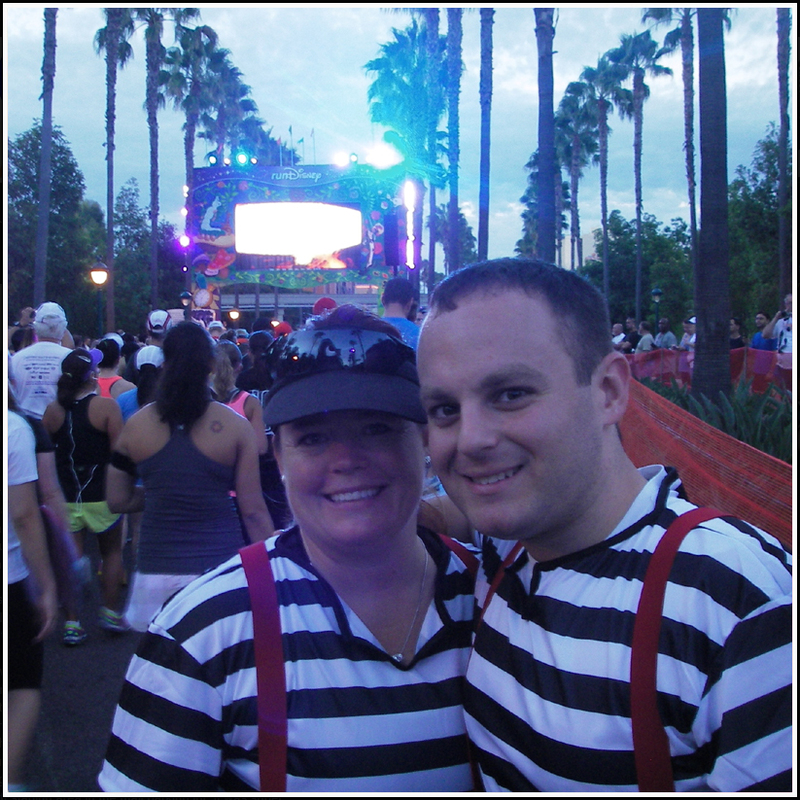 Thankfully, I soon discovered that we were sticking to the theme of the race and going as the fat boys from Tim Burton's "Alice in Wonderland," Tweedle Dee and Tweedle Dum! The photos that follow will come back to haunt me one day. Race morning had me up before my alarm, thanks to adrenaline and the two hour time difference on the west coast. The 5K race started earlier that morning, so we had a slight buffer to get to the start line. 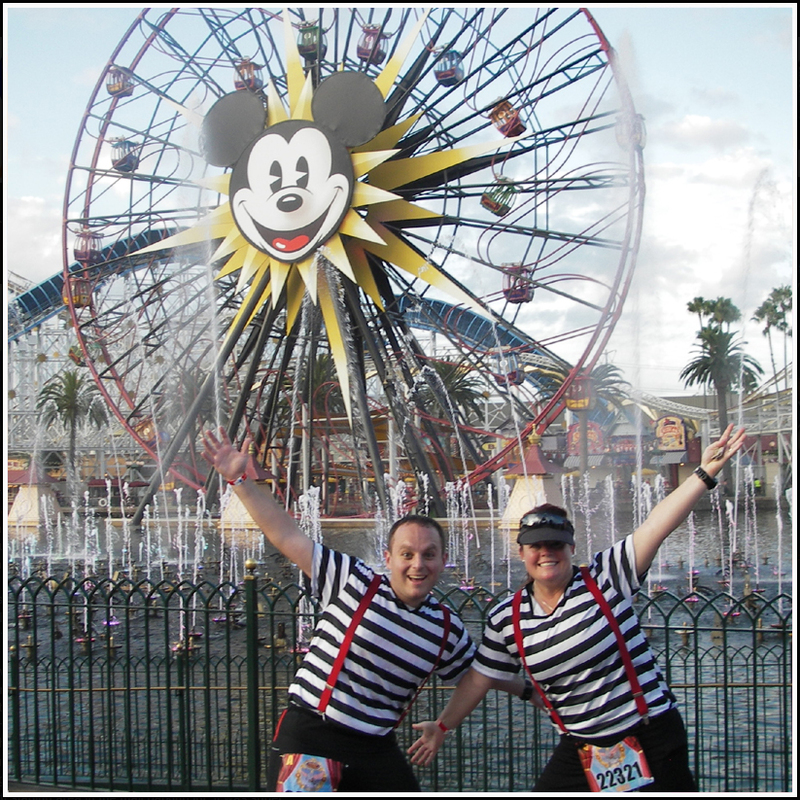 Karen and I got in costume and walked through the streets of Anaheim in the same direction as many other runners. Being recognized as the Tweedle's before even getting on Disney property had me feeling slightly less silly, and I loosened up quickly. The bag check area was easy to get in and out of, and the corrals were within eyesight of the staging area. This was super convenient and easy to manage. We even ran in to Abby dressed as the Mad Hatter, and had a tea party photo op right on the street. I was overwhelmed by the number of runners in costume for the race, even thinking that they may outnumber any other runDisney race I've done. I was already having a lot of fun before the gun even fired. 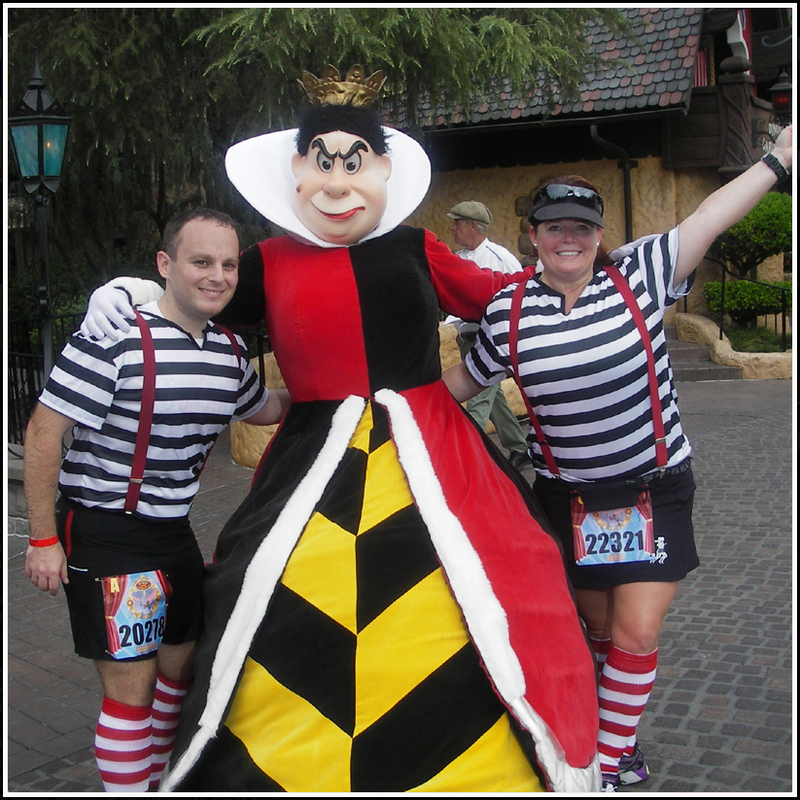 The entire starting line was decked out in Alice theming, and the MC's (Carissa and Rudy) were also dressed as the classic Tweedle Dee & Tweedle Dum animated characters. Karen was in corral C and I was placed in A, but we predetermined that we would stick together for this race to take as many photos as possible. Once we found our place, we could tell that we fit right in and started taking pictures immediately. It didn't take long for our turn to start running. Karen and I took off through the streets of Anaheim around the backside of the Disneyland Park. We had the opportunity to see the new Anaheim Convention Center at mile two just before entering the back side of the park through Cars Land. After that initial segment was over, we knew the remainder of the race would be in the parks and character photo stops would be around every corner. Throughout California Adventure's Cars Land we snapped photos with several "stars" from the Cars movies, and Karen had the chance to make a pit stop for a bathroom break. Why go to a port-o-potty when physical restrooms with soap and sinks are available? From Cars Land we ran around the boardwalk on Paradise Pier where we met with Woody and Jesse and passed the iconic California Screemin' Roller Coaster and Mickey's Fun Wheel. The lights from World of Color were shining in the lagoon, and they were playing music from the nighttime light show. There were "talking flower"characters out from the classic animated "Alice in Wonderland" movie in the area as we approached the newly renovated Buena Vista Street, a visit with Monsters Inc, and the exit of California Adventure. Directly across from one park is the other, with the entrance to Disneyland open wide to runners. We entered the park through the train station spilling out on to Main Street USA. Runners were greeted immediately with a much needed water stop. At the head of Main Street was Sleeping Beauty's castle and a right turn in to Tomorrowland. This loop led us to the Mad Hatter's Tea Party ride and the White Rabbit warning us not to be late for a very important date! We stopped to see him and the Queen of Heats' Playing Card henchmen. There was a tour of the back lot and float dens on the route, as well as the stables with horses and mini cows. The final stretch through Disneyland included a segment of Toontown with Daisy Duck, followed by more Fantasyland photo opportunities with Alice and the Mad Hatter, Queen of Hearts, and Tweedle Dee and Tweedle Dum. At this point in the race, Karen and I realized we had been taking our time and stopping for every photo opportunity. The famed "balloon ladies" had snuck up behind us and were visible, marking the end of the race and the 16 minute per mile pace. Not wanting to get pulled off the course, we had to skip a couple photo opportunities and hustle to the finish. Running through Downtown Disney was stressful as I trudged along with Karen to make sure we crossed the finish in time. The finish line was a welcome sight after this nearly 2 hour 10K. It was hot, and my feet were blistered from all the starting, stopping and standing in line. Karen was starving and I was cranky, but we were done and ready to get back to the hotel to prepare for the half the following day. The medal presented to us for the 10K turned the mood around quickly, though. I'm a fan of how well it stuck to the theme, but would have liked some color incorporated in to the design. These pieces from runDisney are always really well done. As we walked away from the finish area, I noticed that the course had been shut down, there were barricades across the finish line, and the setup for the half marathon the following day had begun. We cut it close, but the 10K was a success in both our eyes. I'm glad that I made the trip to be a part of the inaugural Disneyland 10K. Having it added on to the half marathon weekend and including the Dumbo Double Dare challenge was definitely a deciding factor in getting me to California. The course through the parks was excellent, and a great opportunity to run with a great friend. It was a chance to forget the real world and act silly in a costume, while participating in a race. There aren't many opportunities like this, and the experience is why I keep coming back to runDisney races. Check out all of the photos from the race, including many that I couldn't include in this post, on the NOLArunner Facebook page. 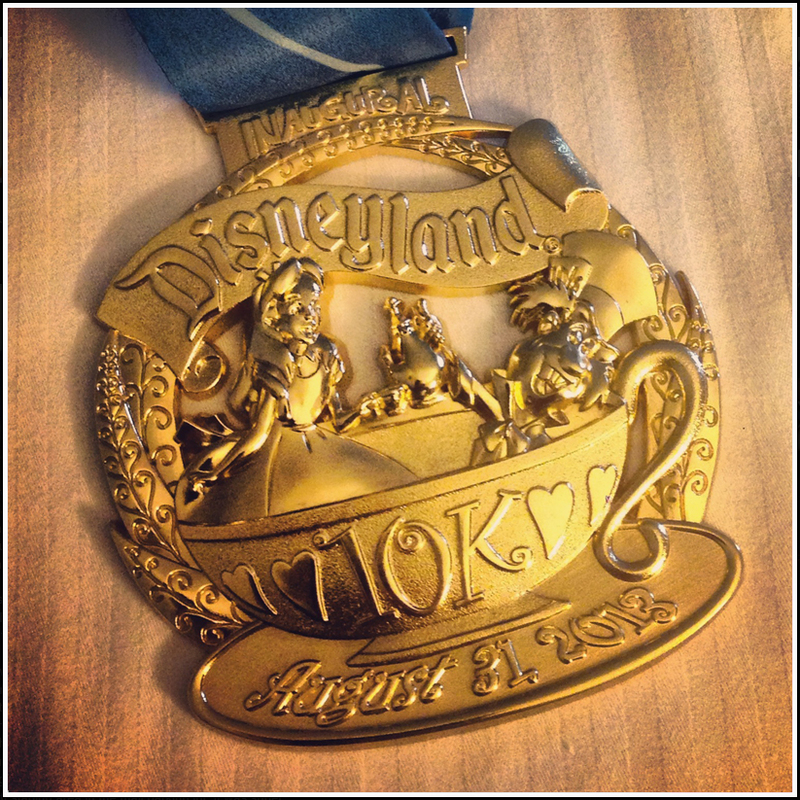 Like it to get updates, including a blog recap from the Disneyland Half Marathon coming soon. LOVE the pic with Woody and Jessie!!!! So awesome. Nice to see you got in the spirit costume and all! I know, Nicole! 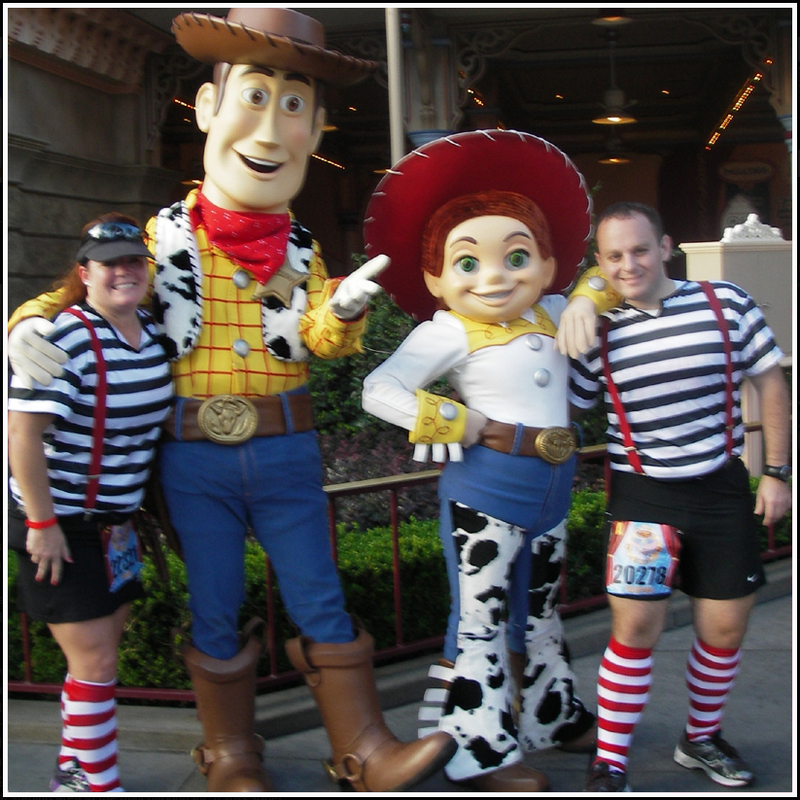 I was so excited that Woody and Jessie were out on the course. At that point in the race, I was in to the costume 100% and started to convince Karen that the next runDisney race would entail me wearing a vest and cowboy hat. She's already rockin' the red fiery locks. I have not agreed to be Jessie.I can just see me running down Main Street USA with a pair of cow print chaps on. I was think more like Merida from Brave and you could be Lord Dingwall? Plenty of time to work on it. I could learn to braid your pig-tails Karen. Puh-lease?! I just want a reason to yell "Yee Haw!" as I run down Mainstreet USA! Love the costumes that you and Karen wore, and really glad to hear that you had fun wearing a costume in a race. I know that doesn't happen every day. And how cool for you guys to be a part of the inaugural event! You should make a list of all such races you've attended, as I'm guessing it would be impressive. Love that Disney offers shorter race options to allow people to get the experience without having to commit to something longer—what an awesome gateway for new runners! I'm not sure the costume affinity will carry over to any event within a 100 mile radius of NOLA, but we'll see. The 10K distance has proven to be highly successful for runDisney, and I'm sure that there are some sprinkled in to the 4 events that were teased by runDisney execs in my Meetup blog. When its combined with another race of a longer distance for a great challenge weekend, I'm in!